This article is about the Dragon Ball character. For other uses, see Goku (disambiguation). In this Japanese name, the family name is Son. Son Goku (Japanese: 孫 悟空（そん ごくう）, Hepburn: Son Gokū) is a fictional character and main protagonist of the Dragon Ball manga series created by Akira Toriyama. He is based on Sun Wukong (Simplified Chinese: 孙 悟空 Japanese: 孫 悟空（そん ごくう）Hepburn: Son Gokū), a main character in the classic Chinese novel Journey to the West. Goku first made his debut in Dragon Ball chapter #1 Bulma and Son Goku (ブルマと孫悟空, Buruma to Son Gokū), originally published in Japan's Weekly Shōnen Jump magazine on June 19, 1984, as an eccentric, monkey-tailed boy who practices martial arts and possesses superhuman strength. He meets Bulma and joins her on a journey to find the wish-granting Dragon Balls. Along the way, he finds new friends who follow him on his journey. Initially believed to have been born on Earth, Goku later learns that he is a member of an extraterrestrial warrior race called the Saiyans, which is also the reason for his superhuman strength, and his birth name is Kakarot (カカロット, Kakarotto). As Goku grows up, he becomes the Earth's mightiest warrior and protects his adopted home planet from those who seek to destroy it. Goku is depicted as carefree and cheerful when at ease, but quickly serious and strategic-minded when in battle and also enthusiastic to fight. He is able to concentrate his Ki and use it for devastatingly powerful energy-based attacks; the most prominent being his signature Kamehameha (かめはめ波), in which Goku launches a blue energy blast from his palms. Also pure of heart, Goku has frequently granted mercy to his enemies, which has often earned him additional allies in the process (though has also resulted in others taking advantage of his kindness), and he is one of the few who can ride the magic cloud called Kinto'un (筋斗雲, lit. "Somersault Cloud", renamed "Flying Nimbus" in Funimation's dub); which was another element adapted from Journey to the West. As the protagonist, Goku appears in most of the episodes, films, television specials and OVAs of the manga's anime adaptations (Dragon Ball, Dragon Ball Z, Dragon Ball GT, Dragon Ball Super and Dragon Ball Heroes) as well as many of the franchise's video games. Due to the series' international popularity, Goku has become one of the most recognizable and iconic characters in the world. Outside the Dragon Ball franchise, Goku has made cameo appearances in Toriyama's self-parody series Neko Majin Z, has been the subject of other parodies, and has appeared in special events. Most Western audiences were introduced to the adult version of Goku appearing in the Dragon Ball Z anime, itself an adaptation of Dragon Ball manga volumes 17-42, as opposed to his initial child form, due to the limited success of the first series overseas. Goku's critical reception has been largely positive and he is often considered to be one of the greatest manga and anime characters of all time. Goku, and Dragon Ball in general, evolved from one of Akira Toriyama's earlier one-shot series called Dragon Boy. In this story, the protagonist looks a lot like Goku, but has a pair of wings. The character Goku is based on Sun Wukong (孫悟空), the central character of the Chinese novel Journey to the West. To be creative with the idea of Sun Wukong, Toriyama designed Goku as a human boy with a monkey's tail, rather than a complete simian, because the tail would give the character a distinguishing feature. He later stated that the tail was a pain to draw, hence why he had it get cut off early on. Toriyama did not initially plan to make Goku an alien, it was not until the introduction of fighters from other planets that he established him as a Saiyan (サイヤ人, Saiya-jin). Goku was given the ability to teleport to any planet in seconds, so that Toriyama could increase the pace of the story. Wanting Dragon Ball Z to have a Chinese appearance, Toriyama used the color of the robes worn by Buddhist monks for Goku's dōgi. During the early chapters of the manga, Toriyama's editor, Kazuhiko Torishima, commented that Goku looked rather plain. Toriyama had given him simple clothes on purpose because it was a fighting manga, so to combat this he added several characters like Master Roshi and Krillin, and created the Tenkaichi Budōkai (天下一武道会, lit. "Strongest Under the Heavens Martial Arts Tournament") to focus the storyline on fighting. To defy the assumption that Goku would win the tournaments, Toriyama made him lose the first and second but win the third. Toriyama also mentioned Torishima wanted Goku to form a relationship with Bulma, but this was never applied to the series. Toriyama's editor was initially against having Goku grow up, saying it was uncommon to have the protagonist drastically change in manga, however, he gave in when Toriyama threatened that he would not be able to continue the series if the character did not. Toriyama later stated he had him grow up as a means to make drawing the fight scenes easier. When Toriyama thought up the Super Saiyan (超 (スーパー)サイヤ人, Sūpā Saiya-jin) concept during the Frieza arc, he felt the only way to show Goku's massive power up was to have him transform. Initially he was concerned that the facial expression looked like that of a villain, but felt it was acceptable since the transformation was brought about by anger. Furthermore, the Super Saiyan form spared the trouble of coloring Goku's hair all the time for the standard black-and-white manga pages. With the conclusion of the Cell games, Gohan was intended to replace his father as protagonist, but Toriyama decided that Gohan was unsuitable for the role. According to Toriyama, Goku is more of a selfish person than a hero as his main interest in the story is to fight strong opponents rather than protecting the innocent. As a result, Toriyama was angered when the anime adaptations of Dragon Ball started portraying Goku as more heroic than his manga counterpart. Dragon Ball GT chief character designer Katsuyoshi Nakatsuru said he agonized over designing Goku's Super Saiyan 4 appearance, which was the idea of the show's producers, questioning whether it was necessary to go further with the transformations. Because Super Saiyan 4 is brought about while in a Saiyan's Ōzaru (大猿, lit. "Great Ape") form, he made the hair more "wild" and covered Goku's body in red fur. There was only a single final draft of the character, although Nakatsuru did consider making the hair blonde, he ended up choosing black as it provides more contrast with the red fur. During the plans of the final story arc of Dragon Ball Super, it was decided that Goku should have another transformation: The Ultra Instinct. The concept was that the Ultra Instinct would be completely different from Goku's previous Super Saiyan transformations. From left to right: Goku in his base form, and in his Super Saiyan, Super Saiyan 2 and Super Saiyan 3 forms. Goku is usually recognized by his unique hairstyle, which does not change in length except in his Super Saiyan forms; where his hair changes in color and length according to the form he takes. This is explained by Vegeta to be a common characteristic of full-blooded Saiyans. Goku's hair color changes from black to golden after ascending to a Super Saiyan, and his irises change from black to turquoise. In his Super Saiyan God form, both his hair color and irises change to a deep red. In his Super Saiyan God Super Saiyan form, both his hair color and irises change to blue (hence its nickname "Super Saiyan Blue"). Goku prefers dressing in a dōgi uniform to show his devotion to Earth, instead of the standard battle fatigues of his race; the only time he actually does wear these garments is during his training with Gohan before the Cell Games. In his early childhood, Goku is introduced wearing a dark colored dōgi uniform with red wristbands and a white obi tied in a bow over the waist. Throughout the majority of the series, however, Goku is commonly seen wearing a red-orange dōgi uniform with a blue short-sleeved undershirt, blue wristbands, a blue obi tied in a knot over the waist, and dark boots with yellow or red stripes. Goku also often wears the encircled kanji of his training masters on the front and back of this uniform; the first being Master Roshi's, "kame" (亀, meaning "turtle"); the second being King Kai's, "kaio" (界王, meaning "world king"); and the third being his own, "Go" (悟, meaning "wisdom" or "enlightenment"). Eventually, Goku stops wearing a kanji on his outfit and wears his obi as a sash around his waist. In Dragon Ball GT, he wears a multi-colored dōgi that consists of a blue fold-over shirt, yellow pants, pink wristbands, a white obi tied in a knot over the waist, and black shoes with white stockings. In Dragon Ball Super, Goku wears his signature red-orange and blue dōgi with his "Go" kanji again, though during the Golden Frieza arc and Universe 6 arc he wears a slightly different dōgi uniform consisting of an orange fold-over shirt and matching pants with blue wristbands, blue boots and a blue obi tied in a knot at the side of his waist (which debuted in the film Dragon Ball Z: Resurrection 'F'). In the Japanese version of every Dragon Ball anime series and subsequent related media, Goku has been voiced by Masako Nozawa. Toriyama selected Nozawa upon hearing her audition sample, remarking that only Goku could sound like that. Nozawa stated that she was ecstatic when she got the role because she had always wanted to be in one of Toriyama's works. She said she had to be mindful of the fact that Goku grew up in the mountains and did not know much of the world. Despite having to voice Goku, Gohan, Goten and Bardock, Nozawa claims she is able to instantly get into the respective character simply upon seeing their image. Nozawa explained that she did not read the manga so that she would not know what was coming in the story until recording, making her reactions the same as Goku's. In Harmony Gold's very brief dub of the original Dragon Ball series, Goku (renamed "Zero") was voiced by Barbara Goodson. In Funimation's initial dub of the anime, Goku was voiced by Saffron Henderson in the first 13 episodes of the original Dragon Ball series (produced in association with BLT Productions), and by Ian James Corlett and Peter Kelamis in the first 67 episodes of Dragon Ball Z (edited into 53 episodes; produced in association with Saban and Ocean Productions). In AB Groupe's dub of the anime produced exclusively for Canadian and European broadcast (initially also in association with Ocean Productions and later with Blue Water Studios), Goku was voiced by Peter Kelamis again and later Kirby Morrow in episodes 123-291 of Dragon Ball Z, by Zoe Slusar as a child in both Dragon Ball and Dragon Ball GT, by Jeffrey Watson as an older teen in Dragon Ball, and by Jeremiah Yurk as an adult and Super Saiyan 4 in GT. In Bang Zoom's dub of the first 27 episodes of Dragon Ball Super produced exclusively for Toonami Asia's broadcast, Goku was voiced by Lex Lang. Cover of Weekly Shōnen Jump No. 51, 1984 featuring Goku and Bulma in their first appearances. Goku first appears in Dragon Ball as a monkey-tailed child adopted by the hermit Gohan. Before the series' narrative begins, he accidentally and unknowingly kills Gohan on a full-moon night when he temporarily transforms into the mighty Ōzaru after staring at a full moon. However, Goku loses the ability when his friends cut off his tail. Living alone with an item known as a Dragon Ball which he keeps as a memento of Gohan, Goku befriends a teenage girl named Bulma. He joins her to find the seven Dragon Balls, which, when gathered, summon the wish-granting dragon Shenron. They encounter the desert bandit Yamcha and two shapeshifters named Oolong and Puar, who also join their quest. Goku is later trained by the martial artist Master Roshi, alongside a Shaolin monk named Krillin, who becomes his best friend. It is Roshi who gives Goku the Nimbus cloud (as a reward for saving his pet sea turtle), which becomes Goku's primary source of flight travel across the world. Goku's first shown martial arts attack as a child is Jan ken (ジャン拳), three physical blows modeled after the hand signs in rock-paper-scissors. As a child, he also wields the Nyoi-bō (如意棒, lit. "Mind Stick", renamed "Power Pole" in Funimation's dub), a magic staff that extends and retracts on command; given to him by his late grandfather. However, Goku's signature attack is the Kamehameha, which he learned from Master Roshi. The Kamehameha is a concentration of Ki, released as a concussive beam. Roshi spent about 50 years developing and perfecting the technique, but, as a child, Goku is able to understand and copy the technique immediately after only one demonstration. After training with the Earth's god, Kami, Goku learns to fly by virtue of the technique Bukū-jutsu (舞空術, lit. "Air Dance Technique") and uses the Nimbus less frequently for flight travel. While participating in the World Martial Arts Tournament that attracts the most powerful fighters in the world, Goku battles foes, later turned allies, such as Tien Shinhan and Chiaotzu, as well as the Namekian Piccolo. After becoming the runner-up champion of the 21st and 22nd tournaments, Goku finally wins in the 23rd with Piccolo's defeat, and marries Chi-Chi soon after to fulfill a promise he made to her years ago despite not knowing what marriage was back then. Five years later, Goku meets his evil older brother Raditz and sacrifices himself to defeat Raditz after he learns about his heritage. Goku comes from a race of extraterrestrials called Saiyans, himself having been sent from their home planet to prepare Earth for sale on the intergalactic market by destroying all its life. While Grandpa Gohan was taking care of him, Goku suffered a severe head injury and forgets his mission to conquer Earth. In order to fight the Saiyans invading Earth, Goku trains with King Kai in the afterlife. He teaches Goku the Kaiō-ken (界王拳, lit. "World King Fist"), which multiplies his ki and strength for an instant, but with possible strain to the body. It is also from King Kai that Goku learns his most powerful attack: the Genki-Dama (元気玉, lit. "Energy Sphere", renamed "Spirit Bomb" in Funimation's dub), an energy sphere created by gathering ki from surrounding animals, nature and humans. After being revived by the Dragon Balls, Goku faces off with the Saiyan prince Vegeta, who eventually becomes another ally. On his journey to Planet Namek in order to aid his friends in gathering the Namekian Dragon Balls to revive the ones killed by the Saiyans, Goku fights the galactic tyrant Frieza, who destroyed the Saiyans' home planet and nearly the entire race. During his epic battle with Frieza, Goku becomes the first Saiyan in a thousand years to transform into a fabled Super Saiyan. After defeating Frieza and barely escaping the destruction of Namek, Goku learns a teleportation skill called Shunkan Idō (瞬間移動, lit. "Instant Teleport", renamed "Instant Transmission" in Funimation's dub), taught by the inhabitants of the planet Yardrat. However, Goku contracts a heart virus whereof the time-traveler Trunks warns him, but recovers after taking medicine provided by Trunks. Later, Goku trains his first son Gohan to be his successor and sacrifices himself again during the battle against the evil bio-android Cell. Goku is temporarily resurrected on Earth seven years later and meets his second son Goten. Goku also battles Vegeta again after Vegeta falls under the control of the wizard Babidi. Shortly after, he is drawn into a battle for the universe against the monster Majin Buu. Despite having mastered two new Super Saiyan transformations, Goku teaches Goten and Trunks to take his place. After his life is fully restored, Goku attempts to fuse with Gohan in order to defeat Buu, but this fails when the latter is temporarily absorbed by Buu and so he persuades the newly arrived Vegeta to fuse with him, creating Vegito (ベジット, Bejitto, "Vegerot" in Viz Media's manga translation). Eventually, Goku destroys Buu with a Spirit Bomb attack. Ten years later, during another World Martial Arts Tournament, Goku meets Uub, Buu's human reincarnation, and leaves with him, intending to train him as the new protector of Earth. After defeating Majin Buu, Goku meets a new opponent known as Beerus, the God of Destruction in the film Battle of Gods. An alternative, more innately powerful form known as the Super Saiyan God (超 (スーパー)サイヤ人ゴッド, Sūpā Saiya-jin Goddo) is reached by Goku during this film. Though the temporary transformation wears off, Goku manages to harness its godly powers in his base Super Saiyan form. In its sequel film Resurrection 'F', Goku manages to achieve a blue-haired evolution of Super Saiyan God under Whis's tutelage, known as the Super Saiyan God Super Saiyan (超 (スーパー)サイヤ人ゴッドSS (スーパーサイヤ人), Sūpā Saiya-jin Goddo Sūpā Saiya-jin) or "Super Saiyan Blue" for short, which Goku uses to battle the newly revived Frieza. These forms also appear in Dragon Ball Super and its manga tie-in, which expand upon the stories from the two films, and replace them as the new canon. Afterwards, Goku and his friends participate in a fighting tournament set between Beerus and his brother Champa, facing warriors from the universe Champa oversees as its God of Destruction. During this tournament, Goku reveals that he has learned to combine the perfect ki control of his Super Saiyan Blue form with his older technique, the Kaiō-ken; creating a variation called "Super Saiyan Blue Kaiō-ken". Although Goku gives up after fighting his opponent, Hit, his team ends up winning the tournament. After meeting with the omnipotent being known as Zeno, Goku encounters an evil alternate version of himself called "Goku Black", who is terrorizing Future Trunks' timeline. Black is eventually revealed to be a rogue Kai named Zamasu, who has stolen Goku's body from yet another alternate timeline and teamed up with the Zamasu of Future Trunks' timeline to fulfill their "Zero Mortals Plan". After Zamasu and Black become even more dangerous by undergoing Potara Fusion during the battle in Future Trunks' timeline, Goku ultimately summons the future version of Zeno who erases the entire universe and Zamasu. Goku and the others present there manage to escape in their time machine, and later Goku and Future Trunks use the time machine again to bring Future Zeno to the present timeline. Later, Goku requests Whis to hire Hit to assassinate himself, but his reasoning behind this is to get another chance to fight Hit. Shortly afterwards, Goku causes the Zenos to decide to hold a multi-universal martial arts tournament with the losing universes wiped from existence. After enlisting nine of his allies to fight alongside him in the "Tournament of Power", Goku ends up recruiting Frieza as well. Across the tournament, Goku defeats multiple warriors, but is nearly killed by one named Jiren. During this fight, Goku reaches a new form known as Ultra Instinct. All of a sudden, Jiren fires an energy blast at the stands housing the remaining members of the tournament. Goku immediately gets in the way of the attack, and deflects the energy blast away from his friends. Goku then overwhelms Jiren in a fit of rage until succumbing to his power's immense pressure as it fades, causing his body to spasm while appearing to be defeated. Luckily, Android 17 and Frieza are still in the tournament as they team up with only the former left in the ring. Goku and Frieza actually work together to force Jiren out of bounds in a triple elimination. After Android 17 uses his wish on the Super Dragon Balls to restore the erased universes, Goku and his team part ways with a fully revived Frieza and return to their "normal" lives on Earth. In the film Dragon Ball Super: Broly, Goku and Vegeta encounter another Saiyan survivor named Broly, whom Frieza has recruited to defeat them. When Broly proves to be too powerful for either of them to handle individually, Goku and Vegeta use the Metamorese Fusion Dance, which creates Gogeta (ゴジータ, Gojīta), who sports slight visual differences from their previous merger. Gogeta almost defeats his opponent, but Broly's allies Cheelai and Lemo use the Dragon Balls to teleport Broly back to the barren planet he grew up on. Later, Goku teleports to this planet as well to provide Broly, Cheelai and Lemo with Capsule Corp. survival supplies, and states that he'd like to spar with Broly again someday. In the anime-only sequel series, Dragon Ball GT, Goku is transformed back into a kid by an accidental wish made by his old enemy Pilaf using the Black Star Dragon Balls while Pilaf was about to wish to take over the world. Goku, Trunks and his own granddaughter Pan travel the universe to search for the Black Star Dragon Balls and return them to Earth to prevent its destruction. After acquiring the Super Saiyan 4 transformation, Goku battles the evil Tuffle Baby, Super Android 17, and the evil Shadow Dragons. His final challenge is against Omega Shenron, whom he destroys using the Spirit Bomb. Goku leaves with the original form of Shenron, but not before saying his goodbyes to his friends on Earth. He then appears 100 years later at the next World Martial Arts Tournament as an adult, where he watches a battle between Goku Jr., his descendant, and Vegeta Jr., Vegeta's descendant. An elderly Pan sees him, but he quickly departs. Goku has appeared in various other media including an unofficial Taiwanese live-action film and an unofficial Korean live-action film. He was portrayed by Justin Chatwin in the 2009 20th Century Fox feature Dragonball Evolution. Goku has also appeared in almost every Dragon Ball licensed electronic video game, including crossover games such as Jump Super Stars, Jump Ultimate Stars and Battle Stadium D.O.N. In 1992, Goku was featured in the interactive game Dragon Ball Z: Get Together! Goku World, in which Goku and his gang travel back in time to review events in the Dragon Ball timeline and interacts with his younger self. In December 2007, Goku made a guest appearance in avatar form in the MMORPG Second Life for a Jump Festa promotion titled Jumpland@Second Life. Goku also appears in the Dr. Slump and Arale-chan video game for the Nintendo DS. Goku has been the subject of, and is mentioned in, various songs. "Son Goku Song" and "Gokū no Gokigen Jānī" feature Goku as a child singing about himself. During his adult years, the song "Aitsu wa Son Gokū" by Hironobu Kageyama, where Kageyama praises everything about Goku, and the duet "Ore-tachi no Energy" feature words spoken by the character. For the release of the single of the Dragonball Evolution international theme song "Rule", Toriyama supplied CD artwork of singer Ayumi Hamasaki dressed as Goku. Goku has been used in Japanese public service announcements aimed at children. In June 1988, Goku and other Dragon Ball characters were featured in two PSA short films. The first, in which Goku is taught the importance of obeying traffic safety by others, is entitled The Goku Traffic Safety (悟空の交通安全, Gokū no Kōtsū Anzen). The second is called The Goku Fire Fighting Regiment (悟空の消防隊, Gokū no Shōbō-tai), in which he teaches two children the importance of fire safety. Goku's appearance on Yamada Katsute-nai Wink. Goku has made guest appearances in various Japanese television shows and manga. In 2005, Goku appeared in the Toriyama parody manga Neko Majin Z where he is the sensei of the main character Z. On September 15, 2006, in celebration of the 30th anniversary of Kochira Katsushika-ku Kameari Kōen-mae Hashutsujo, the special manga Super Kochikame (超こち亀, Chō Kochikame) was released. The chapter entitled This is the Police Station in front of Dragon Park on Planet Namek (こちらナメック星ドラゴン公園前派出所, Kochira Namekku-sei Dragon Kōen-mae Hashutsujo) has Ryotsu Kankichi travel to planet Namek and try to issue Freeza a citation and scold he and Goku for parking their ships illegally. Goku and other Dragon Ball characters join the cast of One Piece in the 2006 crossover manga Cross Epoch. He also appears in a single panel of Toriyama's 2013 manga Jaco the Galactic Patrolman, which is set before the events of Dragon Ball. The collected tankōbon volume of Jaco features the bonus story Dragon Ball Minus: The Departure of the Fated Child, depicting how and why Goku's father and mother, Gine (ギネ), sent him to Earth. Goku has been the subject of various parodies. In the episode Career Day of Takeshi's Castle, known in the United States as MXC, the hosts Beat Takeshi and Sonomanma Higashi dressed as popular anime characters, one as Goku as a child, the other as Doraemon. Weekly Shōnen Jump's Gag Special 2005 issue, released on November 12, 2004, featured a Bobobo-bo Bo-bobo one-shot Dragon Ball parody manga, a retelling of the first fight between Goku and Vegeta. In chapter #179 of the Yakitate!! Japan manga, Kawachi executes a Genki-Dama parody called a Shinrai-Dama (信頼玉, lit. "Trust Ball") on the character Katsuo. In the manga and anime series Blood Lad, the character Staz performs the gestures for Goku's Kamehameha, having learned it from his favorite manga superhero, but it has no actual effect. Goku's appearance as a commentator at the 2007 Nippon Ijin Taishō. Goku regularly appears on Fuji TV. In 2003, Goku appeared in the interactive feature Kyutai Panic Adventure! (球体パニックアドベンチャー!, Kyūtai Panikku Adobenchā!, "Orb Panic Adventure! "), which was featured exclusively at the Fuji TV headquarters in the Kyutai (orb) section. In this, Freeza attacks a visiting tourist, blasting the orb section free from the rest of the Fuji TV building. Goku fights Freeza over the real life aqua city of Odaiba. In 2004, a sequel called Kyūtai Panic Adventure Returns! (球体パニックアドベンチャーリターンズ!, Kyūtai Panikku Adobenchā Ritānzu!, "Orb Panic Adventure Returns!") was produced. On March 25, 2006, Goku and Freeza appeared in an original animated short film in the IQ Mirror Mistake 7 (ＩＱミラーまちがい７, Aikyū Mirā Machigai Nana) segment of the Japanese game show IQ Supplement (IQサプリ, IQ Sapuri). On April 7, 2007, Goku and Fuji TV announcer Masaharu Miyake were commentators on the anime segment in the Nippon Ijin Taishō (日本偉人大賞, "Japan Great Man Awards") titled Saikyō no Ijin ha Dare? (最強の偉人は誰？, "Who is the Strongest Hero?"). The segment featured a special tournament to decide who was the greatest person in Japanese history. During the intermission, Goku promoted the coming release of R2 Dragon Ball DVDs. Since the U.S. debut of Dragon Ball Z in 1996, Goku has appeared in American pop culture. He was featured in an issue of Wizard magazine in which he and Superman fought a hypothetical battle and won. In the Codename: Kids Next Door episode "Operation: R.E.P.O.R.T", Numbuh Four's version of the story is a parody of the Goku and Freeza's battle in Dragon Ball Z. Goku appears in Robot Chicken in a sketch entitled A Very Dragon Ball Z Christmas, where Goku and Gohan fight an evil Mrs. Claus with Santa's reindeer, in an attempt to save Christmas. The Saturday Night Live sketch TV Funhouse titled Kobayashi depicts real-life hot-dog-eating champion Takeru Kobayashi as able to transform into a Super Saiyan as he prepares to eat hot dogs; Goku appears briefly near the end. Goku is referenced in the songs "Goku" and "Anime" by Soulja Boy Tell 'Em, where he brags that he looks and feels like Goku. Goku appears in a parody of the film Moneyball on an episode of Mad entitled Money Ball Z, in which Billy Beane drafts Goku and a couple of other Dragon Ball characters into the Oakland A's. In 2013, he and Superman fought in a "Death Battle" episode of the Rooster Teeth web series ScrewAttack. The episode "Goku vs. Superman" in the web series Epic Rap Battles of History won a Streamy Award for Best Music Video. The use of the Kamehameha attack became an Internet meme which started with Japanese schoolgirls photographing themselves apparently using, and being affected by, this attack. It has also attracted considerable media attention in France, Germany, as well as in many Spanish-speaking countries in South America. Goku's character has been well received by publications for manga, anime and other media. Anime News Network noted Goku as a good source of comedy and remarked that after everything he experiences, he still remains a naïve character. Tim Jones from THEM Anime Reviews noted that Goku is not an omnipotent character in the first anime series, unlike Dragon Ball Z, and does not disappear for long periods of time between sagas. They also liked the way the series' depict his entire adventures, making him a good main character. Rationalmagic.com praised Goku's innocence as one of the funniest parts of the series. According to Julius Weideman, Goku's journey and ever-growing strength resulted in the character winning "the admiration of young boys everywhere." In 2015, the Japan Anniversary Association officially declared May 9 as "Goku Day" (悟空の日, Gokū no hi). In Japanese the numbers 5 and 9 can be pronounced as "Go" and "Ku" respectively. Jason Thompson stated that unlike the "manly" heroes of other popular shōnen manga of the late 1980s and early 1990s, such as City Hunter and Fist of the North Star, Toriyama made his protagonist (Goku) cartoonish and small, thus starting a trend that Thompson says continues to this day. One Piece creator Eiichiro Oda and Naruto creator Masashi Kishimoto said that Goku inspired their protagonists as well as series structure. Commenting on Goku's popularity, Kishimoto stated that when people hear the name "Son Goku", no longer do they think of the Journey to the West character, but instead Dragon Ball's protagonist comes to mind. Additionally, for the second half of the series, Kishimoto created an ape named Son Goku in reference to Toriyama's character to the point the ape has four tails just like the four-star Dragon Ball Goku earned from his grandfather. Masako Nozawa, the Japanese voice actor who plays Goku in the Japanese dubs, said that she liked young Goku with his tail because he was cute, and stated that the character was still the same even at the end of the series. Jackie Chan has gone on record stating that Goku is his favorite Dragon Ball character. Goku was ranked number one in IGN's 2009 Top 25 Anime Characters of All Time and reappeared on the same list in 2014, however, on this occasion they ranked him third, with Cowboy Bebop's Spike Spiegel and Neon Genesis Evangelion's Shinji Ikari placed above him, saying that "He was, in many ways, a character that bucked the trends of his time and defined the direction of shonen manga/anime for decades." In Mania Entertainment's 10 Most Iconic Anime Heroes, Thomas Zoth commented that "Goku and Dragon Ball completely revolutionized shōnen manga." In a Newtype poll from March 2010, Goku was voted the fifth most popular male character from the 1980s. Goku ranked consistently high in the Anime Grand Prix poll in the category of "best male character" in the late 1980s and early 1990s, appearing seventeenth in the 1987 poll, fifteenth in the 1988 poll, second in the 1989 poll, fourth in the 1990 poll, third in the 1991 poll, fourth in the 1992 poll, thirteenth in 1993 poll, and twelfth in 1994 poll. In a 1993 character popularity poll for the series, Weekly Shōnen Jump readers voted Goku second, after his son Gohan. He came in first in the magazine's 1995 poll, as well as in a 2004 poll amongst fans of the series for the book Dragon Ball Forever. In a 2005 The Daily Reader article entitled "The Greatest Geek Movie Heroes of All Time", Goku is the only animated character listed, and is ranked tenth. In a survey of 1,000 people, conducted by Oricon in 2007, Goku ranked first place as the "Strongest Manga character of all time." In the survey "Friendship" developed by rankingjapan.com, in which people chose which anime character they would like as a friend, Goku ranked fifth. In 2000, Goku placed third in an Animax poll of favorite anime characters. NTT customers voted him as their third favorite black haired male anime character. Despite his positive reception, Goku also received negative feedback for his characterization in Dragon Ball Super due to how his constant desires for fighting stronger enemies resulted in setting up a story where all universe could be destroyed. While Anime Now's Richard Eisenbeis believes Goku is determined to protect his universe, the fact that he does not care about other loser universes being destroyed also received negative response. In January 2017, Nowaza won two Guinness World Records for her longevity as Goku; she has been the sole voice actor for the role for over 23 years. Goku was also the first manga character to have a balloon at the Macy's Thanksgiving Day Parade, with his first appearance at the 2018 parade. Several pieces of merchandising based on Goku have been released, including action figures, plushes, and keychains. The German rock band Son Goku takes their name from the Dragon Ball protagonist. The band's lead singer Thomas D chose the name because Goku embodies the band's philosophy, saying he was "fascinated by Goku's naïveté and cheerfulness, yet, at the same time, a great warrior saving the world." In 2010, a fiberglass statue of Goku was created by Chinese artist Edison Chen, with Chen's facial features instead of Goku's, as part of Chen's "I Hate You For Looking!" collection that was displayed at the "Treacherous Treis" exhibition. CNN released an article explaining how Goku was Rafael Nadal's childhood inspiration, and called Nadal "the Dragon Ball of tennis" due to his unorthodox style "from another planet." ^ "週刊少年ジャンプ　1984/06/19　表示号数51". Media Arts Database (in Japanese). Agency for Cultural Affairs. Retrieved March 21, 2017. ^ Toriyama, Akira (September 15, 1985). "4 亀仙人の筋斗雲". 孫悟空と仲間たち. Dragon Ball (in Japanese). 1. Shueisha. ISBN 4-08-851831-4. ^ Yadao, James S. The Rough Guide to Manga. Penguin Books, October 1, 2009. p. 117. ISBN 1405384239, 9781405384230. Available on Google Books. ^ Toriyama, Akira (August 9, 1995). "Before Dragon Ball Pt. 1". DRAGON BALL 大全集 2: STORY GUIDE. Dragon Ball (in Japanese). Shueisha. p. 46. ISBN 4-08-782752-6. ^ a b c Toriyama, Akira (August 9, 1995). DRAGON BALL 大全集 2: STORY GUIDE. Dragon Ball (in Japanese). Shueisha. pp. 164–169. ISBN 4-08-782752-6. ^ Toriyama, Akira (2004). DRAGON BALL 天下一伝説 (in Japanese). Shueisha. pp. 80–91. ISBN 4-08-873705-9. ^ Toriyama, Akira (October 9, 1995). "鳥山明的超会見 第４回". DRAGON BALL 大全集 4: WORLD GUIDE. Shueisha. pp. 164–168. ISBN 4-08-782754-2. ^ Toriyama, Akira (June 25, 1995). "鳥山明的超会見 第１回". DRAGON BALL 大全集 1: COMPLETE ILLUSTRATIONS. Shueisha. pp. 202–207. ISBN 4-08-782754-2. ^ Toriyama, Akira (1986). Dr. Slump, Volume 16. Viz Media. p. 130. ISBN 978-1-4215-1060-6. ^ "Shenlong Times 1". DRAGON BALL 大全集 1: COMPLETE ILLUSTRATIONS (in Japanese). Shueisha. 1995. ^ Toriyama, Akira (1995). DRAGON　BALL　大全集　5: TV ANIMATION PART 2. Shueisha. pp. 206–210. ISBN 4-08-782755-0. ^ "Thus Spake Dr. Slump". Wired (3.01). March 1997. ^ DRAGON BALL アニメイラスト集 「黄金の戦士」 (in Japanese). Shueisha. 2010. pp. 78–79. ISBN 978-4-8342-8413-3. ^ "クライマックスを迎える『ドラゴンボール超』宇宙サバイバル編を作り出した職人たち" (in Japanese). Official Dragon Ball Website. March 9, 2018. Retrieved March 10, 2018. ^ Toriyama, Akira (October 7, 1992). "375 ベジータ、トランクス発進！！". セルの完全体　完成！！. Dragon Ball (in Japanese). 32. Shueisha. ISBN 4-08-851687-7. ^ Toriyama, Akira (May 15, 1989). "390 悟空と悟飯外へ". セルゲーム始まる. Dragon Ball (in Japanese). 17. Shueisha. ISBN 4-08-851688-5. ^ "全てオレが片付ける！！新生ベジータ親子出現". Dragon Ball Z. Episode 154. August 26, 1992. Fuji TV. ^ "Chinese Characters: Turtle". About.com. Archived from the original on November 5, 2007. Retrieved June 24, 2007. ^ a b Toriyama, Akira (July 15, 1989). "211 界王さまと、がんばる死人孫悟空！". 孫悟空とピッコロ大魔王. Dragon Ball (in Japanese). 18. Shueisha. ISBN 4-08-851615-X. ^ Toriyama, Akira (January 15, 1991). "279 不思議な孫悟空". 悟空か！？ギニューか！？. Dragon Ball (in Japanese). 24. Shueisha. ISBN 4-08-851414-9. ^ a b Toriyama, Akira (November 15, 1991). "337 集う超戦士たち". 未来から来た少年. Dragon Ball (in Japanese). 28. Shueisha. ISBN 4-08-851418-1. ^ Jump Comics (1997). Dragon Ball GT: Perfect File 1. Dragon Ball (in Japanese). Shueisha. p. 6. ISBN 4-08-874089-0. ^ Toriyama, Akira (September 10, 1995). "鳥山明的超会見" [Akira Toriyama Super Interview]. DRAGON BALL 大全集 3: TV ANIMATION PART 1 [Dragon Ball Great Complete Collection 3 TV Animation Part 1]. Dragon Ball (in Japanese). Shueisha. p. 202. ISBN 4-08-782753-4. ^ DRAGON　BALL　超全集 4 超事典. Shueisha. 2013. pp. 340–345. ISBN 978-4-08-782499-5. ^ "Interview with Saffron Henderson". www.myfavoritegames.com. ^ "DBZ Uncensored: Interview With Ian Corlett". dbzu.3gkai.com. ^ "DBZ Uncensored: Interview With Peter Kelamis". dbzu.3gkai.com. ^ "The Secret of the Dragon Balls". Dragon Ball Vol 1 (DVD). Episode 1. Funimation. Event occurs at Closing credits, English Language Cast. ^ "Dragon Ball DVD Season 2 Uncut Set". Anime News Network. Retrieved 2017-07-14. ^ "Kyle Herbert, Sean Schemmel Returning in Dragon Ball Z Kai Buu Saga Dub". Anime News Network. Retrieved 2017-07-14. ^ "Stars behind Dragon Ball Z, Christopher R. Sabat, Sean Schemmel to Appear at Otakon 2015". Anime News Network. Retrieved 2017-07-14. ^ Toriyama, Akira (January 15, 1986). "22 悟空の大変身". ドラゴンボール危機一髪. Dragon Ball (in Japanese). 2. Shueisha. ISBN 4-08-851832-2. ^ Toriyama, Akira (September 10, 1985). "8 ヤムチャおそるべし!!". 孫悟空と仲間たち. Dragon Ball (in Japanese). 2. Shueisha. ISBN 4-08-851831-4. ^ Toriyama, Akira (January 15, 1986). "13 亀仙人のかめはめ波！！". ドラゴンボール危機一髪. Dragon Ball (in Japanese). 2. Shueisha. ISBN 4-08-851832-2. ^ Toriyama, Akira (May 15, 1989). "195-204". かつてない恐怖. Dragon Ball (in Japanese). 17. Shueisha. ISBN 4-08-851614-1. ^ Toriyama, Akira (July 15, 1989). "205 あの世でファイト！！". 孫悟空とピッコロ大魔王. Dragon Ball (in Japanese). 18. Shueisha. ISBN 4-08-851615-X. ^ a b Toriyama, Akira (February 25, 1996). DRAGON BALL 大全集 7: DRAGON BALL 大事典. Dragon Ball (in Japanese). Shueisha. ISBN 4-08-782756-9. ^ Toriyama, Akira (November 15, 1989). "224 孫悟空の静かな怒り". いそげ！孫悟空. Dragon Ball (in Japanese). 19. Shueisha. ISBN 4-08-851616-8. ^ Toriyama, Akira (November 15, 1991). "336 ３年後の賭け". 未来から来た少年. Dragon Ball (in Japanese). 28. Shueisha. ISBN 4-08-851418-1. ^ Toriyama, Akira. "503 孫悟空最後の合体！！". バイバイ ドラゴンワールド. Dragon Ball (in Japanese). 26. Shueisha. ISBN 4-08-851090-9. ^ "Even Stronger!! Goku's Dream is Super-Huge". Dragon Ball Z. Episode 291. January 31, 1996. ^ "Goku's New Super Saiyan God Form Revealed for DBZ: Resurrection 'F' Film". Anime News Network. 2015-04-09. Retrieved 2015-05-09. ^ "You're The Tenth Warrior! Goku Goes To See Freeza!!". Dragon Ball Super. Episode 93. June 4, 2017. ^ "The Miraculous Conclusion! Farewell, Goku! Until We Meet Again!". Dragon Ball Super. Episode 131. March 25, 2018. ^ "FIRST LOOK AT THE 'DRAGON BALL SUPER' MOVIE REVEALS THE BEST IS YET TO COME". ^ "The Mysterious Dragon Balls Activate!! Goku Becomes A Child!?". Dragon Ball GT. Episode 1. February 7, 1996. ^ "A Miraculous Come-From-Behind Victory!! Goku Saves The Universe". Dragon Ball GT. Episode 63. November 12, 1997. ^ "Goodbye, Goku... 'Til the Day We Meet Again". Dragon Ball GT. Episode 64. November 19, 1997. ^ 新七龍珠 神龍的傳說 (Credits) (in Chinese). Joe Chan Jun-Leung. Tai Seng. June 27, 2000. ^ 드래곤볼 싸워라 손오공 이겨라 손오공 (Credits) (in Korean). 1990. ^ Tatiana Siegel (November 13, 2007). "'Dragonball' comes to bigscreen". Variety. Retrieved November 14, 2007. ^ "Dragon Ball, Naruto, One Piece to Enter Second Life". Anime News Network. December 21, 2007. Retrieved November 3, 2008. ^ "Dr Slump Arale-chan feat Son Goku Kid". GameKyo.com. September 26, 2008. Retrieved February 6, 2009. ^ "Son Goku Song". Dragon Ball: Complete Music Collection (CD) (in Japanese). Masako Nozawa. Japan: Columbia Records. October 21, 1991. COCC-9202. ^ "Gokū no Gokigen Jānī". Dragon Ball: Complete Music Collection (CD) (in Japanese). Masako Nozawa. Japan: Columbia Records. October 21, 1991. COCC-9202. ^ "Aitsu wa Son Goku". Dragon Ball Z Hit Song Collection (CD) (in Japanese). Hironobu Kageyama. Japan: Columbia Records. 1989. CC-3768. ^ "Ore-tachi no Energy". Dragon Ball Z Hit Song Collection IV: Character Special (CD) (in Japanese). Hironobu Kageyama and Masako Nozawa as Son Goku. Japan: Columbia Records. October 1, 1990. COCC-6830. ^ "Dragonball's Toriyama Sketches Ayumi Hamasaki as Goku". Anime News Network. February 3, 2009. Retrieved 2009-02-04. ^ a b Dragon Ball DVD Box: DragonBox (Booklet) (in Japanese). Minoru Okazaki & Daisuke Nishio. Japan: Pony Canyon. 2004. 50482. ^ "『ネコマジンZ』ストーリーグイヅェスト" (in Japanese). 〒101-8050 Tokyo-to, Chiyoda-ku Hitotsubashi 2-5-10: Shueisha. Archived from the original (Flash) on September 26, 2009. Retrieved June 5, 2009. ^ Akimoto, Osamu (September 15, 2006). "This is the Dragon Police Station in front of the Park on Planet Namek". Super Kochikame. Kochira Katsushika-ku Kameari Kōen-mae Hashutsujo (in Japanese). 〒101-8050 Tokyo-to, Chiyoda-ku Hitotsubashi 2-5-10: Shueisha. ISBN 4-08-874096-3. ^ Toriyama, Akira; Oda, Eiichiro (December 25, 2006). "Cross Epoch". Shonen Jump. Dragon Ball & One Piece (in Japanese). 〒101-8050 Tokyo-to, Chiyoda-ku Hitotsubashi 2-5-10: Shueisha (4/5). ^ "The Galactic Patrolman's Completed Mission". Weekly Shōnen Jump. Shueisha (44). 2013-09-30. ^ "Akira Toriyama to Draw Manga About Goku's Mom". Anime News Network. 2014-02-05. Retrieved 2014-02-05. ^ Toriyama, Akira (2015-01-06). Jaco the Galactic Patrolman. Viz Media. pp. 232–247. ISBN 978-1-4215-6630-6. ^ "Career Day". MXC. Episode 52. March 24, 2005. Spike. ^ Hashiguchi, Takashi (November 18, 2005). "179 Punch Line". Yakitate!! Japan 20. Yakitate!! Japan. 20. Shougakukan. pp. 11–14. ISBN 4-09-127060-3. ^ "ＩＱミラーまちがい７". IQサプリ. March 25, 2006. Fuji TV. ^ "日本偉人大賞2007". 日本偉人大賞. April 7, 2007. Fuji TV. ^ The Wizard Staff (October 2002). "E@st Vs. West: Goku Vs Superman". Wizard Magazine (133): 64. ^ "Operation R.E.P.O.R.T.". Codename: Kids Next Door. Season 2. Episode 22a. December 5, 2003. Cartoon Network. ^ "Easter Basket". Robot Chicken. Season 2. Episode 23. April 16, 2006. Cartoon Network. ^ "Kobayashi". Saturday TV Funhouse. Episode 93. November 11, 2006. NBC. ^ Suen, Michael (23 July 2010). "Why Anime is Doomed: Soulja Boy Records "Anime" and "Goku," Manga Also in Works". Geekosystem. Retrieved July 29, 2010. ^ "DEATH BATTLE! : Goku VS Superman". Rooster Teeth. Retrieved 2017-10-25. ^ "Japanese Schoolgirls Start New 'Makankosappo' Trend". MusicFeeds.com.au. Retrieved 3 April 2013. ^ "Nova moda online no Japão inspirada no "Dragon Ball"". Diario Digital. Archived from the original on 14 December 2014. Retrieved 3 April 2013. ^ "Memes del ´KameHameHa´, la nueva sensación en Internet" (in Spanish). Capital.pe. Archived from the original on 5 April 2013. Retrieved 6 April 2013. ^ "'KameHameHa', la nueva tendencia que revive el recuerdo de Gokú" (in Spanish). El Tiempo. Retrieved 6 April 2013. ^ "KameHameHa, el nuevo meme de moda que llega desde Japón". Radio Programas del Perú. Retrieved 6 April 2013. ^ Divers, Allen (2001-11-18). "Dragon Ball (manga) Graphic Novel vol 5". Anime News Network. Retrieved 2008-09-27. ^ "Dragon Ball Volume 1 review". Rationalmagic.com. Retrieved 2008-10-03. ^ "May 9 'Officially' Recognized as Goku Day". Anime News Network. 2015-05-09. Retrieved 2015-05-09. ^ Thompson, Jason (2011-03-10). "Jason Thompson's House of 1000 Manga – Dragon Ball". Anime News Network. Retrieved 2013-10-10. ^ Kishimoto, Masashi (2007). Uzumaki: the Art of Naruto. Viz Media. pp. 138–139. ISBN 1-4215-1407-9. ^ Oda, Eiichiro. "Interview with Eiichiro Oda and Akira Toriyama". One Piece Color Walk. One Piece (in Japanese). 1. ISBN 978-4-08-859217-6. ^ Suzuki, Haruhiko, ed. (2003-12-19). "5: Dragon Ball Children". Dragon Ball Landmark (in Japanese). Shueisha. p. 164. ISBN 4-08-873478-5. ^ Jump Comics (December 1997). Dragon Ball GT: Perfect File 2. Dragon Ball GT (in Japanese). Shueisha. ISBN 4-08-874090-4. ^ Toriyama, Akira (June 25, 1995). "I Love Dragon Ball #1: Jackie Chan". DRAGON BALL 大全集 1: COMPLETE ILLUSTRATIONS (in Japanese). Shueisha. p. 7. ISBN 4-08-782754-2. ^ Mackenzie, Chris (October 20, 2009). "Goku wins a place with the best". IGN. Retrieved October 21, 2009. ^ Isler, Ramsey (February 4, 2014). "Top 25 Greatest Anime Characters". IGN. Retrieved March 13, 2014. ^ Zoth, Thomas (January 12, 2010). "10 Most Iconic Anime Heroes". Mania Entertainment. Archived from the original on October 17, 2013. Retrieved January 22, 2010. ^ "NT Research". Newtype. Kadokawa Shoten (4). March 2010. ^ 第9回アニメグランプリ　［1987年6月号］ [The 9th Anime Grand Prix (June issue 1987)] (in Japanese). Animage. Archived from the original on October 19, 2010. Retrieved November 17, 2013. ^ 第10回アニメグランプリ　［1988年6月号］ [10th Anime Grand Prix　(1988 June issue)] (in Japanese). Animage. Archived from the original on October 14, 2013. Retrieved November 17, 2013. 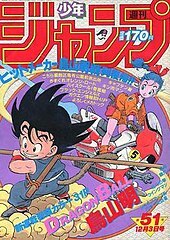 ^ 第11回アニメグランプリ　［1989年5月号］ [11th Anime Grand Prix since (1989 May issue)] (in Japanese). Animage. Archived from the original on October 14, 2013. Retrieved December 7, 2009. ^ 第12回アニメグランプリ　［1990年5月号］ [12th Anime Grand Prix since (1990 May issue)] (in Japanese). Animage. Archived from the original on October 19, 2010. Retrieved November 17, 2013. ^ 第13回アニメグランプリ　［1991年5月号］ [13th Anime Grand Prix since (1991 May issue)] (in Japanese). Animage. Archived from the original on May 23, 2010. Retrieved November 17, 2013. ^ 第14回アニメグランプリ　［1992年5月号］ [14th Anime Grand Prix since (1992 May issue)] (in Japanese). Animage. Archived from the original on July 16, 2011. Retrieved November 17, 2013. ^ 第15回アニメグランプリ　［1993年5月号］ [15th Anime Grand Prix (1993 May issue)] (in Japanese). Animage. Archived from the original on September 13, 2009. Retrieved November 17, 2013. ^ 第16回アニメグランプリ　［1994年5月号］ [16th Anime Grand Prix (1994 May issue)] (in Japanese). Animage. Archived from the original on September 14, 2009. Retrieved November 17, 2013. ^ a b Dragon Ball The Complete Illustrations. Viz Media. October 2008. pp. 215, 217. ISBN 1-4215-2566-6. ^ "Goku wins a place with the best". Anime News Network. 2001-02-25. Retrieved 2008-09-26. ^ "1000 People Chose! The Strongest Character Ranking In Cartoon History!" (in Japanese). Retrieved 2007-10-28. ^ "Which Anime Character Do You Wish You Could Be Friends With?". Anime News Network. 2007-02-28. Retrieved 2009-06-29. ^ Dong, Bamboo (May 5, 2014). "Japanese Fans Rank Their Favorite Black-Haired Anime Characters". Anime News Network. Retrieved May 14, 2017. ^ Eisenbeis, Richard (February 15, 2017). "Why Goku Is Worse Than the Villains in Dragon Ball Super". Anime News Network. Retrieved May 5, 2014. ^ "Goku Voice Actress Masako Nozawa Earns 2 Guinness World Records". Anime News Network. February 1, 2017. Retrieved February 1, 2017. ^ "Dragonball Z BanDai Hybrid Action Mega Articulated 4 Inch Action Figure Goku". Amazon.com. Retrieved 2008-09-11. ^ "Super Saiyan goku dragon ball z 4"" ultimate collection f". Amazon.com. Retrieved 2008-09-11. ^ "Dragon Ball Z DBZ GOKU 13" Plush Toy". Amazon.com. Retrieved 2008-09-11. ^ "Goku & Tenkaichi Budokai - Dragonball Twin Figure Keychain (Japanese Imported)". Amazon.com. Retrieved 2008-09-11. ^ Munichx.de:. "Thomas D. und Bertil Mark im Interview" (in German). Retrieved January 14, 2008. so fasziniert, aufgrund seiner Naivität und Frohsinns und gleichzeitig wurde er zum großen Kämpfer und rettet die Welt. ^ "e.TALIER d.ES c.HENE @ Mandarin Orchard Singapore". October 5, 2010. Retrieved September 29, 2010. ^ Johnson, Christopher (8 October 2010). "Rafael Nadal: The 'Dragon Ball' of tennis". CNN International. Retrieved 31 December 2011. Padula, Derek (2012). Dragon Ball Z 'It's Over 9,000!' When Worldviews Collide. forward by Ryo Horikawa. ISBN 978-0-9831205-2-0. This page was last edited on 18 April 2019, at 01:45 (UTC).